I’ll just come right out and say it: I have fallen hard for navy. Navy painted rooms have been trending lately, and I took the plunge to try the dark hue on our bedroom walls this year. Navy is dramatic yet classy, bold yet sophisticated. Although navy is having a moment right now, I think the dark blue hue is here to stay. It is a rich, beautiful neutral that pairs well with so many colors and decorating styles. 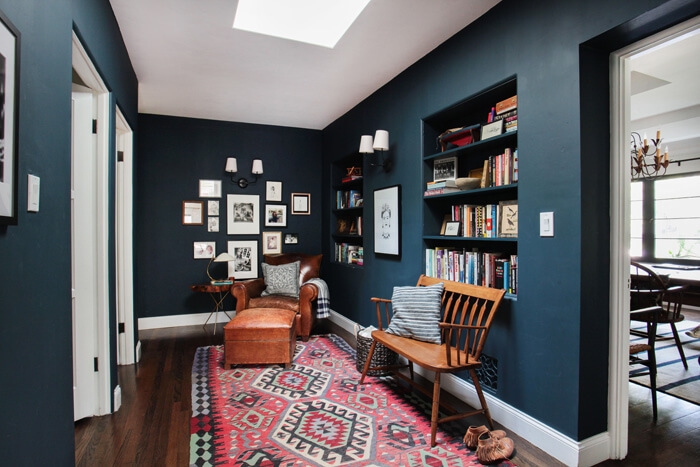 If you are looking to make a statement in a room, consider selecting a navy color for the walls. I am obsessed with the rich, relaxing look of our bedroom since I gave it a makeover this spring. Navy is a great option if you want to incorporate more bold color into your home, while not going overboard. Because it’s so dark, it feels like a neutral while still bringing in some pretty blue. If you are nervous about going so dark on your walls, don’t be! 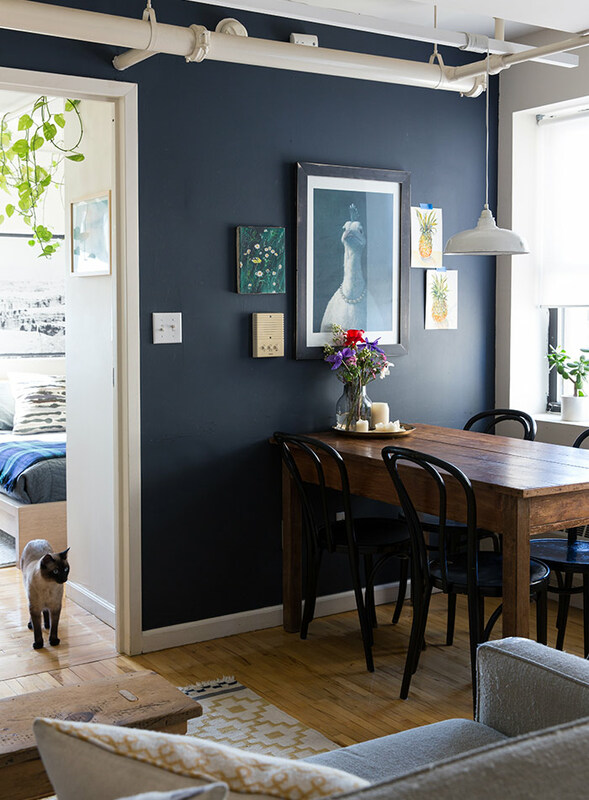 I gathered up examples of my favorite navy paint colors to inspire you to take the plunge and incorporate navy into your home. 4 – Nein! Nein! Nein! Ok Fine! by Clark & Kensington O.P.I. You’ve probably experienced the overwhelm that comes with staring at hundreds of paint swatches at the hardware store. It’s so difficult to know what they will look like on the walls–how are you supposed to narrow it down to just ONE option?! So I did the research for you and rounded up examples of some of the most popular navy paint colors out there. I hope this inspires you and helps narrow down the options! This first photo is my master bedroom. Navy and white is a classic color combination, and the deep wall color is perfect for creating a serene bedroom. See my full bedroom makeover here. 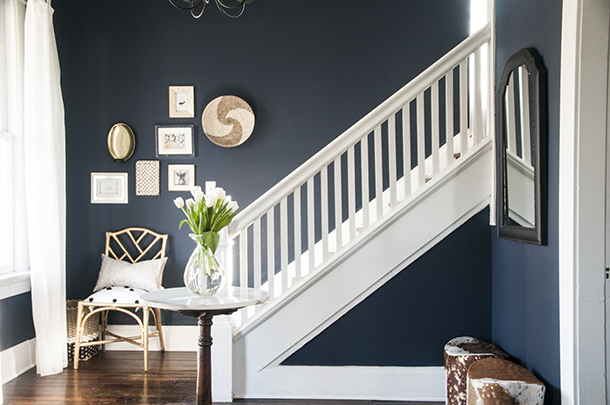 The rich navy walls and bright white staircase make a stunning statement in this foyer. Pair navy walls with rich textiles and leather furniture for a relaxing, handsome space that your husband will approve of. 4 | Nein! Nein! Nein! Ok Fine! by Clark & Kensington O.P.I. How does one get the job of naming paints? I admire their creativity! This navy has grey undertones with a slight blue tint. 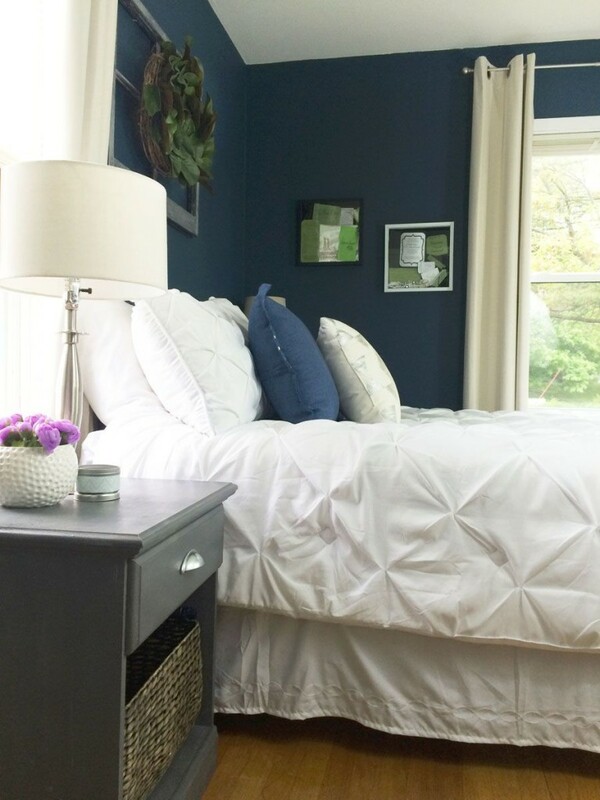 Here’s another bedroom painted in a deep navy blue. To avoid the room feeling stark, incorporate light accessories and a lot of texture to make the room cozy. A room with a lot of natural light is a great place to experiment with darker wall colors. All of that natural light will keep the room nice and bright! 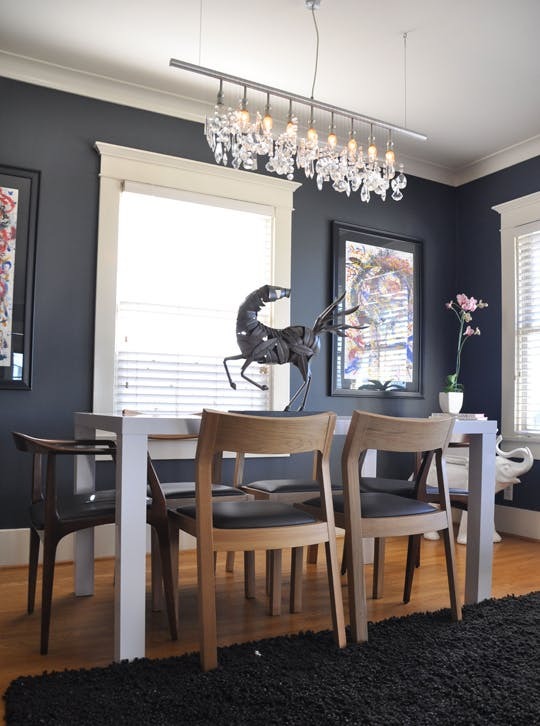 This navy hue is close to dark grey and will pair well with any colors you want to bring into the space. If you are still skeptical about going with dark paint, you could always dip your toes in the water with a navy accent wall. 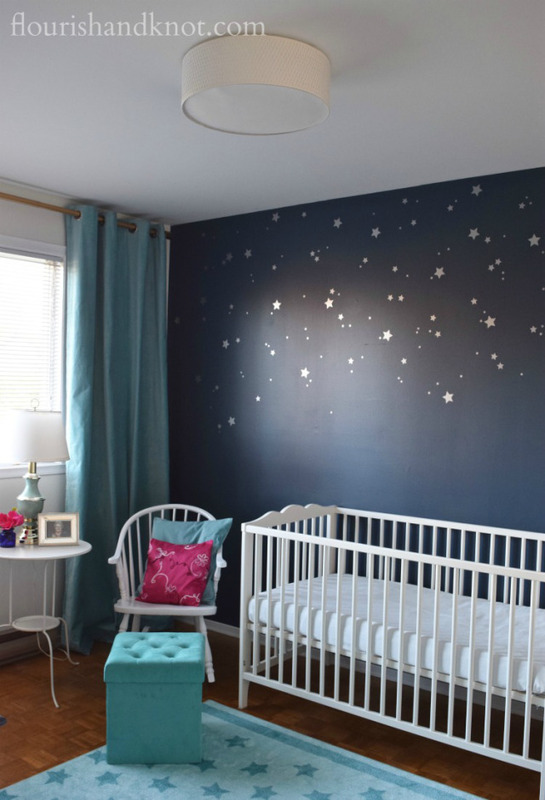 The navy accent wall in this nursery is adorable, isn’t it? Hale Navy is a very popular color choice, so it’s a great option if you’re looking for something tried and true. If you do a quick search online, you’ll find a lot of room makeover photos using this color. 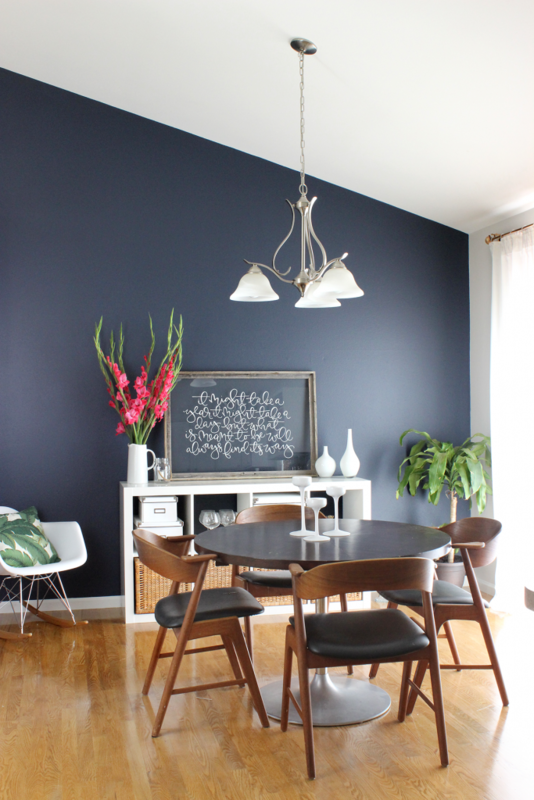 Paint your walls navy for a classy, yet dramatic space. 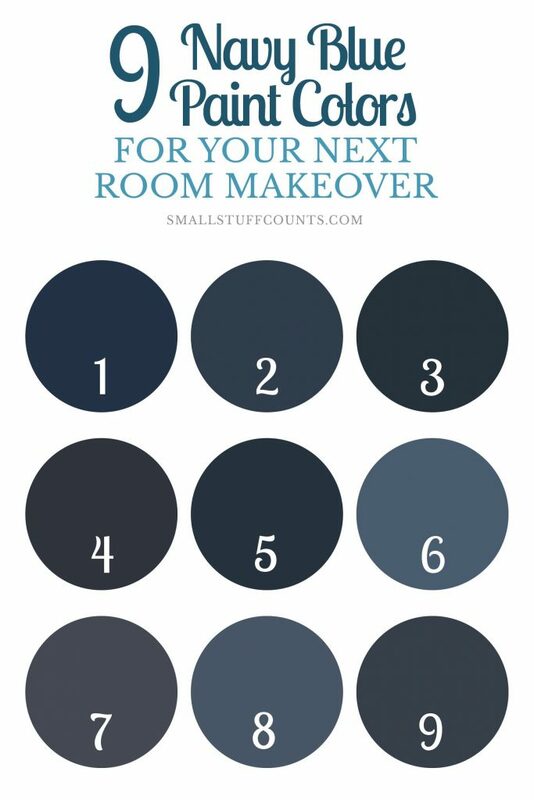 Out of these navy blue paint colors, which is your favorite? Once you’ve narrowed down the paint swatches and decided on the color for your room makeover, you might feel like you’re ready to get rolling. Finally selecting a color is a huge task done! But, if you’re anything like me, you’ll get to the paint store and realize there are so many more decisions left to make before you start painting the walls. You need to know what sheen of paint to choose, which brand is best and how many gallons of paint to buy. Not to mention all of the painting tools…have you ever looked at the number of roller brushes on the shelf? It’s super overwhelming. Oh, and have you thought at all about the type of primer you’ll need to pick up? I’ve been winging my painting projects so far. I’ve done a lot of research online, but it’s difficult to sift through all of the information out there. 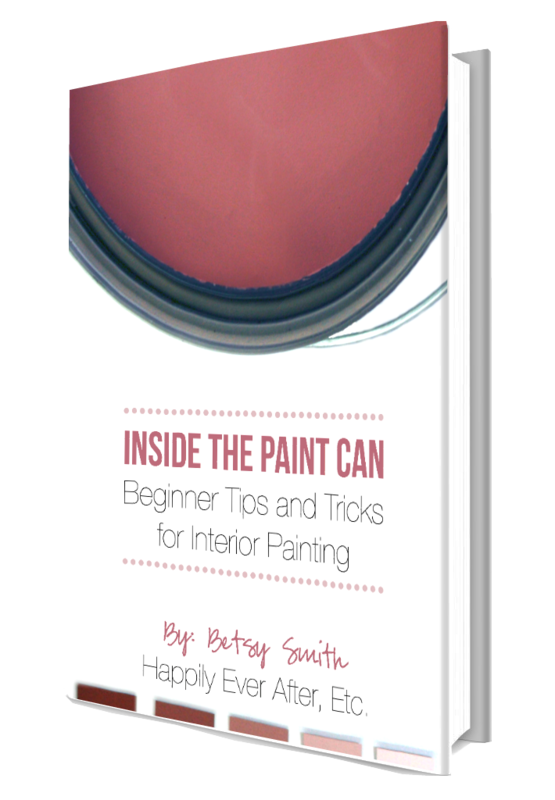 I hadn’t come across a complete guide to interior painting until recently, when a blogger friend gave me a preview of her new book. 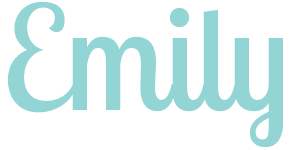 It was so helpful that I became an affiliate for it (this post contains affiliate links). The book is called Inside the Paint Can. How to start each project the right way so that you don’t have problems (like peeling) down the road. How to understand the different types of paint (sample paint, chalk paint, latex and oil) and decide which one is right for you. 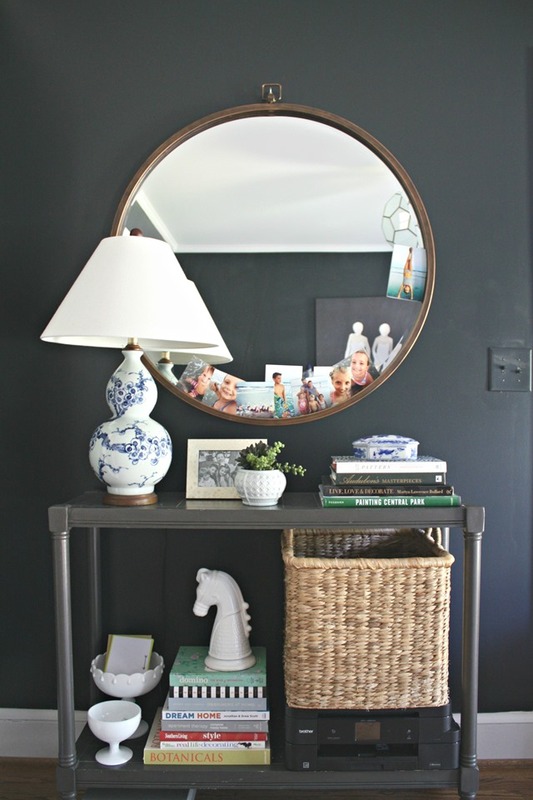 Tips and tricks for painting your space… just like a professional painter! The difference between each paint sheen & how to pick the perfect one for every space in your home. How to pick between all the different rollers & brushes… Why are there so many options?! 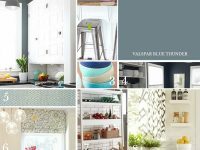 How to find inspiration and select the perfect paint color… so that you’re happy with your choice the first time. 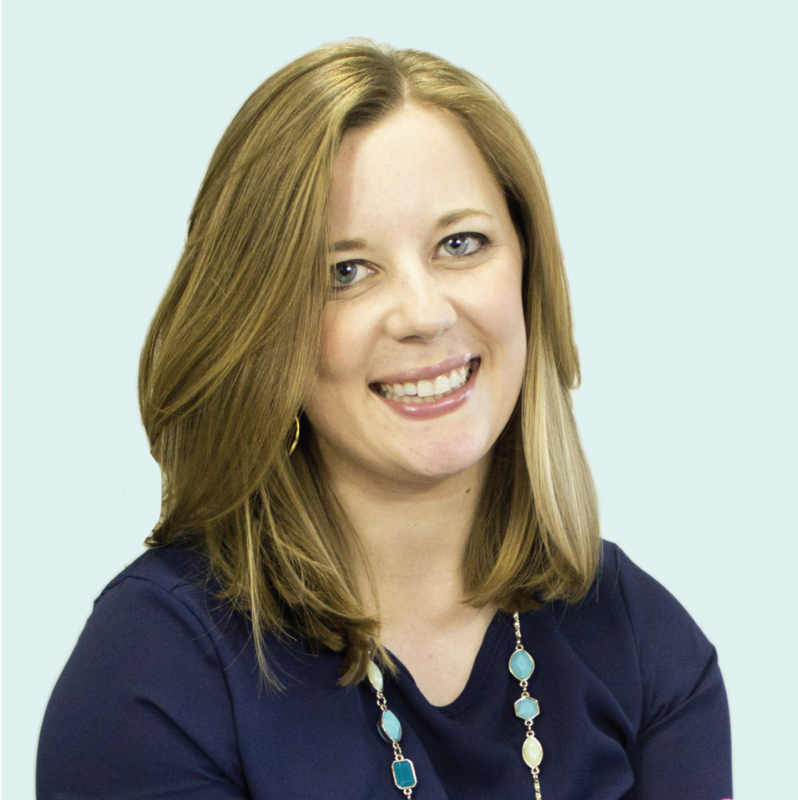 Betsy’s book gave me a much better understanding of all of the paint options out there, and I feel more confident about selecting paint for future decorating projects. If you have painting projects in your future, check out Inside the Paint Can (and snag the special launch price this week!). What questions do you have about paint? Leave a comment and I’ll find an answer for you! This blog post contains affiliate links for your convenience. I only recommend products I know and love. See my disclosure policy for more information. I was just telling my husband that I want to re-do our room to look more “adult”. Right now we do have a themed white/blue room but not blue walls. I LOVE this post! It’s so helpful for planning our re-model and I can’t wait to show my husband. Hey Nicole, I can’t tell you how tickled I am that you found my blog! 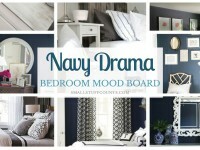 I cannot say enough good things about the navy walls in our bedroom, and I bet you’ll love them, too. Remember, it is only paint so you can always paint it back down the road if you don’t love it. But I bet you will! It definitely makes the room feel more luxurious/adult than it did before. And if you already have lots of blue and white decor, it should be easy to create a pulled together room. Have a great day!